Nobody is perfect and mistakes happen. 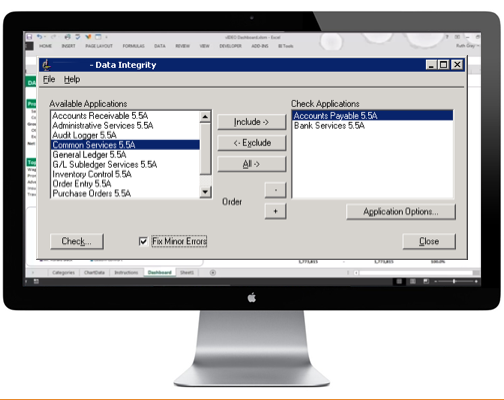 With that in mind, we’d like to share Sage 300 ERP’s Data Integrity function. Sage 300 ERP (formerly Accpac) comes with a built in function that is recommended to run on a regular basis, in order to make sure that your data is fully optimized. This process checks for errors and will fix any minor errors, including orphaned records. While this process is known as Data Integrity, it can be found on the ‘Administrative Services’ tab in Sage 300 ERP and has an icon that looks like a microscope. Simply double click on the icon and you will see a list of all your modules. Highlight the modules on the left and then click on the ‘Include’ button. This will move it to the right hand side of the screen, and it will now be included in the list of applications that you want to be scanned. For instance, if you have reason to believe that there is an issue in A/P, you can check just this single application. However, if you’re running regularly, it is best to include all modules by clicking on ‘All’. Towards the bottom of the screen you will see a check box that says ‘Fix Minor Errors’. Go ahead and check this box to use Sage 300 ERP’s own built in repair mechanisms. It is recommended to have everyone out of the system before you do this, because there is an outside chance that the system will attempt to fix something that is not actually impaired, such as an unfinished transaction that is being entered by someone on the system. Before you run ‘Fix Minor Errors’, you should make sure that you change your print destination to ‘Preview’, so you can look at this document without having to print it to paper. Next, click on ‘Check’, and allow Sage 300 ERP to finish. Depending on how big your database is, this could be a long process, so please be patient. When you’re finished, you will receive a report of the status of all of the modules reporting ‘Warnings’ and ‘Errors’ and if the system was able to automatically fix them. Some of these problems and errors are relatively easy to identify and fix. Others can be more work. If you don’t fully understand how to handle some of these warnings and/or errors, go ahead and send an email to Equation Technologies. We would be more than happy to help you fix them.